Removing unnecessary departmental and policy content improves the user experience of GOV.UK. Clearing up unloved legacy content is always a good idea. This post is intended to help departmental managing editors know how and when to retire content. Provide a URL to redirect users to if it's available to avoid sending people to a dead end. Removing content can cause problems for users who've bookmarked it or shared it on social media. There are 2 options: unpublishing and archiving. Leave a reason in the ‘public explanation’ field wherever possible, and add a redirect to provide a smoother user experience and avoid 404 error messages. You can only redirect to URLs on GOV.UK. Don’t unpublish a document because it’s out of date or no longer current (use archiving for this). Archive content if it was once the primary and accurate source of information about government activity but is now obsolete, for example a policy which is no longer relevant. Send users to its replacement if there is one. The content will still be live in its original context, letting users explore within the architecture of the GOV.UK navigation. Archiving content within GOV.UK keeps it on the live site for posterity. Always leave a reason in the ‘public explanation’ field why you’re archiving the document. This will appear on GOV.UK so don't include any internal information eg names as they can't be changed later. It's not possible to un-archive something so only do this if you're sure it's no longer current. GOV.UK is a historical reference for citizens. Users must be able to look back and see what government did, as well as what it's doing now. Managing editors in departments and agencies can now remove content from GOV.UK within Publisher. If the managing editor is unavailable, contact us. There's technical guidance on how to unpublish in the Publisher instructions. 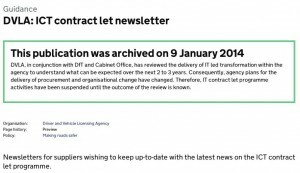 GDS will carry out spot checks on the use of unpublishing and archiving. 1. "Clearing up unloved legacy content is always a good idea". Are there any mechanisms avaiable through GOV.UK (or planned) to help make that check happen, such as every page and PDF having a 'review due date' that appears in reports or dashboards? 2. Archiving. If the old content remains on the site with an archived message, how do we make sure people get to the current info first, and not out of date stuff? Is archived content excluded from search or lower ranking? 3. Assuming the same archiving feature appears for publications? If a PDF file needs to be regularly updated (for example due to the fees involved), are the obsolte files just deleted, replaced or archived, and a new one added? Our current system keeps the full version history of all PDFs, but on the same link so customers get the current version, but we can look back at older ones in case of queries or regulatory challenge. You raise some very good questions so let me try to answer them on behalf of the team. 1. ‘Review by’ date. We’ve been thinking along the same lines and we’re looking to develop an alert that prompts the owner of a piece of content to review it after a period of time. 2. Archiving pages. 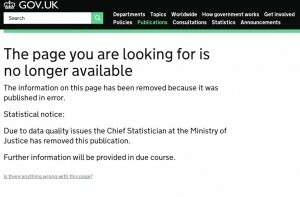 A Google search ranks archived GOV.UK content lower in its results. In GOV.UK site search we don’t currently rank archived content differently but this is something we’re planning to do. 3. Archiving publications. You can archive a publication page (and the publication on it) in the same way. We don’t show previous versions of a PDF on the page, although an editor's description of what has changed is available in the 'page history'. If it is important to show previous versions of a PDF, you could publish different versions of the same document on 1 page, clearly dating the older versions and with the current one at the top of the list. Hi Phil. A big thank you for your reply. It helps address a few concerns from colleagues around validity of information. We fully support your aim to get a review mechanism added; it will reduce the risk of things being forgotten about. It will also reduce some of the tracking we'll otherwise need to do outside of GOV.UK. I'm sure we'd be pleased to work with GDS to make this happen, and perhaps explain the processes we have in place, if that would help. A question for someone who works for the Norwegian Government's website: I'd like to see actual examples of several documents that have been archived (preferably links to archived documents and Archive "Home" if it exists). I have been uble to locate archived pages based on the screenshot in the article. As an editor, I wanted to clarify the point in your guidance on "How to archive a page. It mentions that after a page has been unpublished and reverted to draft, that the draft copy should no longer be deleted as was once the case. Does this mean that in effect all editors will now have a list of draft pages that will continue to grow which we will not be able to do anything with. There are two issues here, 1 the list of unpublished pages that we cannot delete and the possibility that a once unpublished page could end up being resubmitted for publication. Hi Martin - and apologies for the delay in getting back to you. You're right there is a possibility that someone may republish and unpublished content item that is in the draft state. The reason why we say this is that deleting the draft can cause data problems later on. It's a good idea to put clear labelling in the title to make sure this doesn't happen (we add 'Don't publish!' to the content item and save it in draft as well as putting clear instructions using the 'add new remark' button). Developers are working on introducing a new 'state' to publisher (along with 'draft', 'submitted' and 'published') which would be 'unpublished'. All unpublished content would be listed in this part of workflow. We hope to implement this functionality soon. Most of the information on GOV.UK is in the form of attachments to publication pages. You say that archived content "will still be live in its original context" but archived pages have had their attachments removed – leaving a blank thumbnail, a link that reloads the publication page and an email address for different formats (which users are likely to use to request a copy of the document). Is it meant to work this way? Thanks for pointing this out - since that shouldn't happen. Developers are looking into this and we will keep content teams informed about how we are going to solve this issue. This bug has now been fixed, and you can access the attachments again. Alice, I may have identified another problem now attachments on publication pages can be viewed when in archived state. You'll see that it is archived, linked from this archived publication page https://www.gov.uk/government/publications/deposit-marriage-form-japan. It's possible users will bookmark that Word file or third parties put a link to the Word file from other documents or web pages. How will users know it is archived? They will know if they link to the publication landing page, but from experience that will not always happen. It does seem the risk is low as the individual Word file doesn't seem to be picked up from Google. FOI's need to be archived so why is the this ability confined to the managing editor especially when it comes to retiring publications where they do not necessarily have any interest or understanding to make an informed decision ? To help us answer this could you explain why FOIs need to be archived please. FOIs are an answer to a question at the time that it was asked, so we wouldn't expect them to be archived. Please let me know if there's something else we should be aware of.